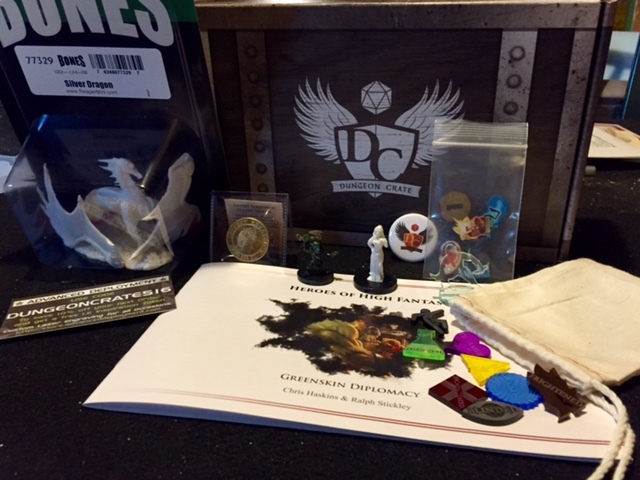 May’s box from Dungeon Crate features two adventures, two sets of tokens, several miniatures and a coin. Dungeon Crate put out its best box yet. We’re pals with the Dungeon Crate guys, but we’re being totally honest: This is great for tabletop players. If you’re a subscribers, you’ll find miniatures, two adventures, a coin and a bunch of tokens and markers. If you play fantasy RPGs and tabletop games, you know this is all the stuff you use constantly. You can subscribe to Dungeon Crate for $29.95 per month (plus shipping) or less with longer subscriptions. Considering what you get in each month’s box, that’s a steal. From Nord Games comes this 23-page adventure for any campaign setting and any party level. (No joke: There are monster stat blocks with challenge ratings for three different ranges of levels.) It’s written for D&D’s 5th edition, but you can easily adapt it to anything else. It starts with an orc warband attacking a town in the dead of night. Adventurers are secretly approached to track down the orcs and find out why they’re attacking. It’s a fun adventure to throw down for a one-off session in between major pieces of a campaign or as the start of a homebrew campaign. Best of all: It can be played in a single session. This is awesome. I’ve eyeballed this silver dragon miniature, cast in Reaper’s white plastic Bones material, for awhile. I have a lot of Bones minis, and they’re great. This sculpt in particular is a badass-looking dragon. And you can always use more dragons. I’ve enjoyed the coins from Shire Post Mint included in past Dungeon Crates, but this is the best yet. 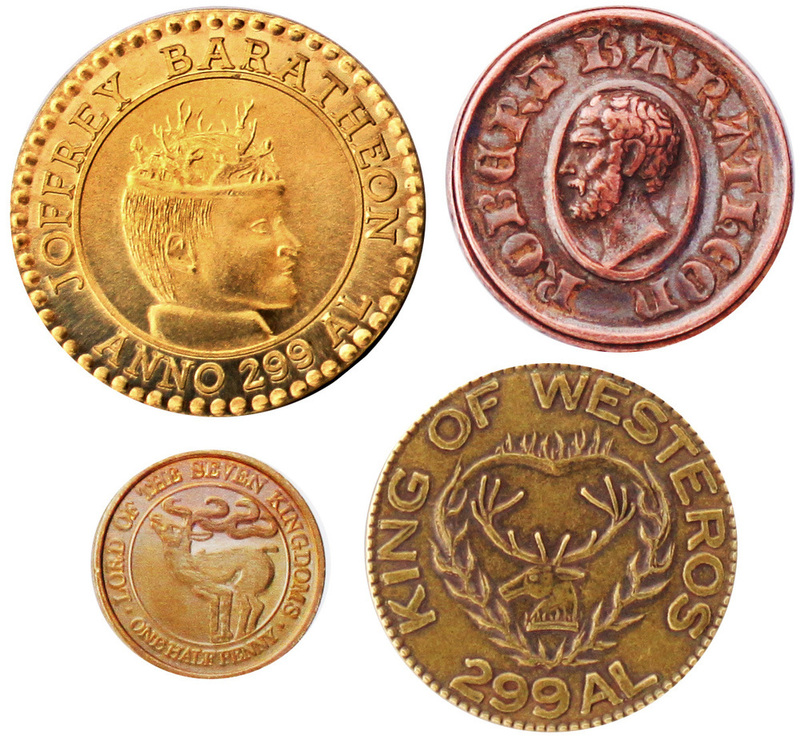 It’s a full-size gold coin from A Game of Thrones worth 1 gold dragon in Westeros. It’s a pretty coin, and weighty. From Dungeon Crawler, this pair of minis are usable for just about any RPG campaign. The painted goblin is a feisty looking little thing, and the seductress is a great townsfolk mini (though she’s bare and needs a little paint). I’ve eyeballed their stuff for a long time (especially their amazing kraken), and I’m happy I have a couple in my collection now. These are going to be very useful. If you play D&D’s 5th edition, you need some markers to denote conditions such as paralyzed, poisoned, blinded and charmed. Best of all is the marker for invisible, which is a stand-up, clear acrylic marker you can sub out for a miniature. I need more of these, so I’ll be doing some shopping with Advanced Deployment. Need a quick adventure? Drop this little side quest from Adventure a Week on your players. It’s a quick little dungeon, and it’s fun. These acrylic pieces – Elite Tokens from Broken Egg Games – don’t have usages as specific as the condition tokens above, but they’re useful for spells and for marking maps. It’ll take a little more finagling to figure out exactly how to use them, but they sure are pretty. Total retail value: About $56, but probably more considering I made some conservative estimates and since you would pay shipping for every single item. Anyway, this is a great value and this box has a great group of of items. I’ll be using all of them in my games.